Pringles wants to anchor itself into the minds of every gamer. The Kellogg company has nearly doubled its investments into the competitive gaming space in the last year alone. Pringles first partnership began with ESL in October 2017 by sponsoring the ESL One event in Germany. The following year, Pringles sponsored 2 events — one in Germany and one in Poland. Now in 2019, the company will be sponsoring 7 events across 13 European countries. 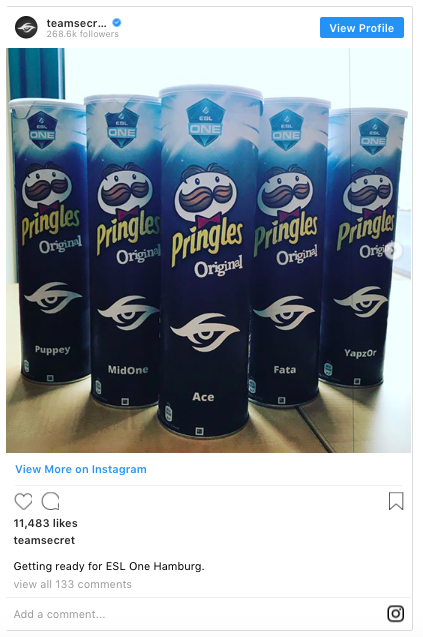 Pringles is not alone when it comes to investing into esports. Global brand investment in the space, is estimated to top $897 million in 2019, 3x higher than it was in 2015, according to analytics firm Newzoo.